I thought I’d gotten past what it was like to be a child alone in the dark. Yomawari is an upcoming game from Japanese publisher Nippon Ichi Software that captures the innocence and fear of being a child wandering the dark unknown. Check out the trailer below. We’re then shown the protagonist, a little girl cowering in the dark. I’ll go look for them. What awaited was a creepy, dark town, completely unlike the familiar town during the daylight. After the title splash “Yomawari,” we see the girl walking down a road and a dark shadow follows her. She looks around and there’s nothing there. 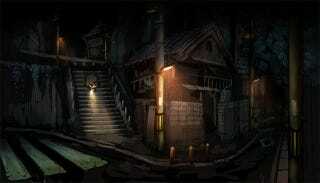 The scene then moves through the town, into a dark warehouse where we see the girl looking up at a strange shadow. We’re then shown a serious of gameplay sequences with the girl searching. Different things show up in the darkness, including a spectacularly freaky-looking monster. A young girl passes numerous nights. Searching for precious things that have disappeared in the darkness. Do you remember the fear of the night? The sequence ends with the girl at a shrine where a set of teeth close in from above and below the screen, biting down with a wet squelch, and drops of blood spattering the screen. For the first time in her life, a young girl is forced to think of death. Even those who have forgotten the fear of the streets at night were once children, scared of the dark. The game looks delightfully macabre and morbidly adorable. I cannot wait. Yomawari is scheduled for release in Japan on the PS Vita on October 29th. No word on an international release.